A-Frame Vertical Banners are great displays for impact marketing our selection of Pop up A-frame Vertical Banners offers a range of portable signs and displays, including trade show displays, exhibition displays, sales banners, promotional and advertising banners, and indoor and outdoor banners and signs, as well as sports banners. A Frame banners are available in a range of practical sizes to meet your requirements. These are ideal branding platforms for events where you need something portable and eye catching to stand out from the crowd. Pop up A-frame Banners are immediate attention-grabbers. They carry your corporate marketing message printed on a Pop-Out Display in vivid colors and they are quite simply, fun to look at. Custom pop out banner comes with dye sublimation you can now get truly rich vibrant colors on a digitally printed fabric.Our dye-sublimation printing permanently bonds your colors right into the fabric. The folding A frame banner also makes them safe to use on sports fields, since they present no risk of injury to the players. And when it comes to dismantling, it folds up neatly into a carry bag. Pop up A-Frame banners are a lightweight, portable and convenient style of indoor / outdoor display. These A-frame banners offer instant visibility. The folding metal A frame banner can collapses back into a convenient storage bag between uses, making them excellent for sporting events, promotions, trade shows, and directional signage. Pop Up A frame banners are ideal for golf courses, festivals, soccer fields, football stadiums, beaches, volleyball courts, and many other sporting events where compelling branding materials are required. Our Pop Out or Pop up A-frame Vertical Banners offer a large canvas for any company marketing messages and logos you want to promote. Our pop up banners are fast to assemble and are easy to pack away, light in weight, weatherproof and can be pegged down for maximum stability. Our pop up banners or bean banners are fast to assemble and are easy to pack away, light in weight, weatherproof and can be pegged down for maximum stability. The Pop up banner is often confused with the A-frame banner, which has a rigid framework to keep the banners in place. 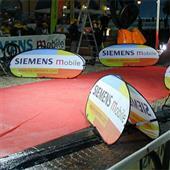 Both the Pop up and A-frame banners are widely used and ideal for trade shows and sporting events. The Pop up banner is often confused with the A-frame banner, which has a rigid aluminum framework to keep the banners in place. 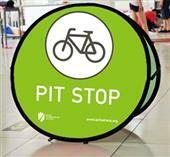 Both the Pop up and A-frame banners are widely used and ideal for trade shows and sporting events. The vertical A framer banner print quality is exceptional and each banner comes with its own pegs and carry bag included. You will pack these safe to use and nearly as easy to get back into the bag as they were to get out. Pop up A-frame Banners come in a range of sizes, shapes such as horizontal or vertical and are printed on sturdy polyester fabric, using the dye sublimation process. These golf banner A frame have been engineered to withstand the elements and can be staked to the ground and weighted using the built-in sand pockets. 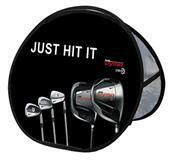 Golf pop out banner is perfect for use outdoors, at sporting events, Golf days, county shows or indoors at exhibitions. Whatever the marketing activity or advertising message our pop up banners will get you maximum exposure with minimum fuss. 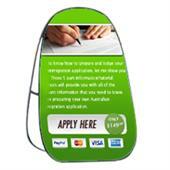 The triangle pop up banner is very popular used outdoor which made from a lightweight but strong fiberglass frame. Its unique pop up system allows it to be set up in 30 seconds! 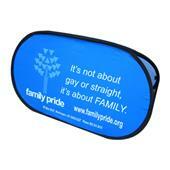 The banners come in their own carry bag for easy transportation and storage. 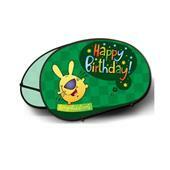 Round pop up banner is a distinctive shape that is ideal for many rounded designs of logos and brands. It has a durable, patented frame allowing you to set-up in just 30 seconds. It is available in a choice of two sizes and digital or 4 color print. The banner has its own carry bag for easy storage.